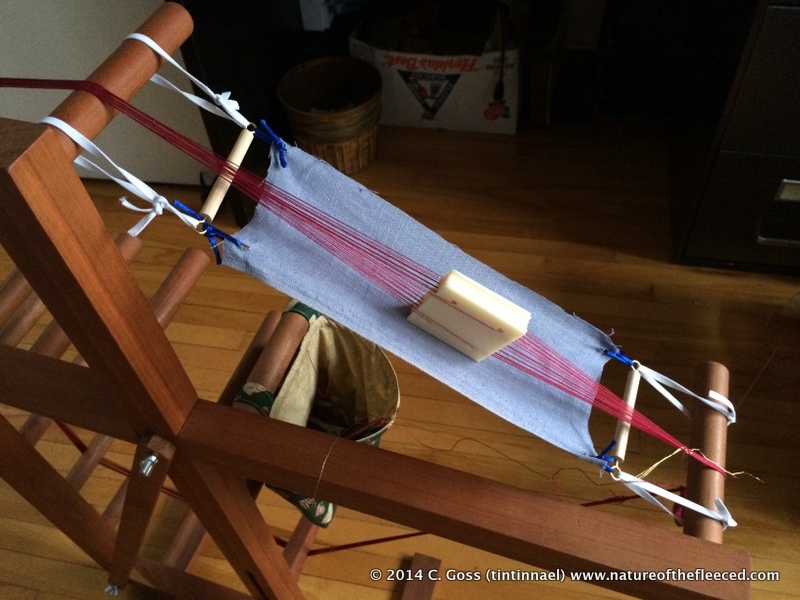 Some weave structures and yarns are difficult to manage on a fixed-tension tablet or inkle loom. The tablets like to sneak out of position while you’re weaving, and if you prefer to take the tension off the loom between weaving sessions (as I do), the weight of the cards can damage the threads. This is my prototype weaving sling/hammock/thing. The dowels hold the fabric to its full width, and the elastic tying the dowels to the loom keeps the fabric at just the right tension to hold the cards steady when not in use. So far, I’m very pleased with the results, but there are sure to be refinements in the future!